Out of the Woodwork is not the creation of a single mind. Really, it’s the collaboration of hundreds of creative minds displayed in a small, convenient package. With the help of graphic designer Regan Nishikawa, I recently launched a T-Shirt campaign designed to support this site and its featured talent. The image drew on the idea that, though I am the face of this website, Out of the Woodwork is built on the work of hundreds of other people. Their talent and support have made this place what it is. I am simply the one who ties the work together and gives it as a gift to my readers. I spend a lot of time preaching about how we should support positive new artists, so I took this opportunity to practice what I preach. If you didn’t already know, Soren Bryce has been raising money for her official EP for the past few weeks. 25% of the profit from these shirts will go directly to that effort. News of this collaborative fundraising reached WWIR Radio and was announced during the Twitter Tuesday Live interview with Soren. The campaign itself was set to last 3 weeks. Two have passed, and our sales goal has already been exceeded! I am grateful for all the support that this audience has shown us, and I can’t wait to see this shirts proudly displayed all across the US and Australia! If you are wondering if you can still pick one up, good news. Sales are still open for the next 6 days! 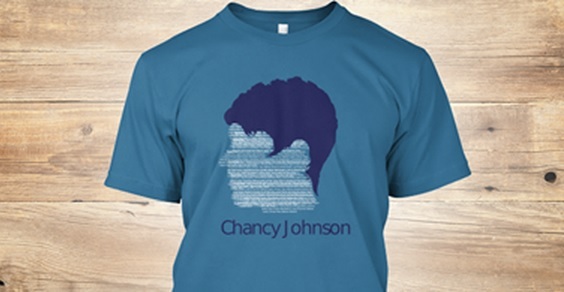 For all who have purchased or plan to purchase a shirt, be sure to tag me in a photo on Facebook or Twitter @ImChancyJohnson for the chance to be featured in our upcoming promotional video! Just make sure you’re wearing your shirt. That’s all the news for today, keep your eyes peeled for more exciting interviews and events in the near future. This entry was posted on June 4, 2014 by Kaleb Eisele and tagged Chancy Johnson, Limited edition tees, OOTWW, teespring.